After dominating the international box office last year with Transformers: Age of Extinction, the only movie to earn more than $1 billion in 2014, director Michael Bay returns with 13 Hours: The Secret Soldiers of Benghazi, an action-thriller ripped from the headlines. Today, Paramount Pictures has released a new red band trailer and the second trailer, following the red band and green band trailers that debuted back in July. This explosive thriller explores the 2012 terrorist attack that shocked the world, while exploring the heroes who fought back against these insurgents. 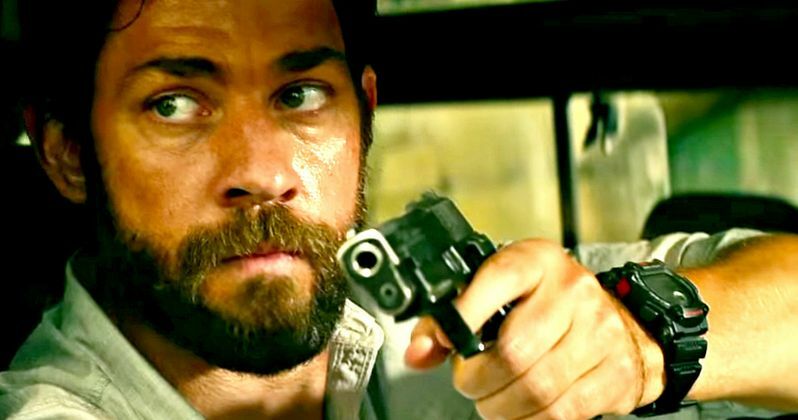 13 Hours is based on the book of the same name by Mitchell Zuckoff, which chronicles dual terrorist attacks on the US State Department Special Mission Compound and a nearby CIA station called the Annex in Benghazi, Libya, which took place on September 11, 2012, exactly 11 years after the tragic 9/11 attacks. The adaptation follows six U.S. soldiers who fought back against the terrorists in the attack, which claimed the lives of U.S. Ambassador Christopher J. Stevens, a foreign service worker and two contract workers. These six soldiers exemplified true courage under extreme duress, and now the true story of their heroism will be told on the big screen. 13 Hours: The Secret Soldiers of Benghazi stars John Krasinski, James Badge Dale, Pablo Schreiber, David Denman, Max Martini, Toby Stephens, Dominic Fumusa and David Costabile, with Paramount setting a January 15, 2016 release date. Michael Bay directs from an adapted screenplay by Chuck Hogan (The Town, The Strain), with Erwin Stoff producing. The movie adaptation will go up against The 5th Wave and a pair of sequels, Ride Along 2 and The Nut Job 2 on January 15, 2016. It was originally believed that, following 13 Hours: The Secret Soldiers of Benghazi, the filmmaker will start production on the action movie sequel Transformers 5, which has an entire "writer's room" currently working on the script. The filmmaker revealed in September that he hasn't officially signed on for Transformers 5 yet, so we'll have to wait and see what his plans for the lucrative franchise may be. The writer's room has also been tasked with crafting ideas for future sequels and spinoffs, but it isn't known how the director will be involved in those projects. In addition to the new trailer, Paramount has also released the first poster for 13 Hours: The Secret Soldiers of Benghazi. Michael Bay previously brought another true story to life on the big screen with 2013's Pain & Gain. We'll have to wait and see how this project fares in theaters early next year. Do you plan on seeing 13 Hours: The Secret Soldiers of Benghazi when it arrives this coming January? Let us know what you think after checking out the trailer and poster. Will Ride Along 2 Finally Take Down Star Wars at the Box Office?